A full entry by Dr. Alexandra Zvereva is available on request. This remarkably finely handled portrait has been attributed to Pierre Dumonstier by Dr. Alexandra Zvereva. The artist’s work has been recognised thanks to sketches of his brother Etienne, and most pivotally his drawings of Armand de Gontaut-Biron, annotated as ‘by Pierre Dumonstier for Daniel Dumonstier (Bonnat Museum, Bayonne). He is also known thanks to two engravings by Thomas de Leu with ‘P. Dumonstier, Th. De Leu fecit’ – portraits of Guillaume Le Gangneur (1594) and Jean de Beaugrand (1595). Zvereva notes that his handling was exceptionally precise, as seen here, and his line delicate. She observes his specific technique for modelling sitters with the aid of very short strokes that followed their various contours and overall form. Our portrait, with its extraordinary display of armour – the sense of its volume and encasement of its sitter – is an astonishing example of the artist’s neat dexterity and painterly vision. Private collection, France until 2017. Filippo di Piero Strozzi was an Italian condottiero, a member of the Florentine family of Strozzi, though his associations were mainly with France, hence his portrait by a French artist. Although Filippo was born in Florence to Piero Strozzi and Laudomia de' Medici, his father had been exiled from his native city, and had been received in France by Queen Catherine de Medici, appointed as Marshal of France. As a boy, Filippo was page to the future King Francis II. In 1557 he entered the French army and in 1558 took part in the Siege of Calais against England, in which his father was killed. By 1563 he was appointed Colonel of the French Royal Guards. 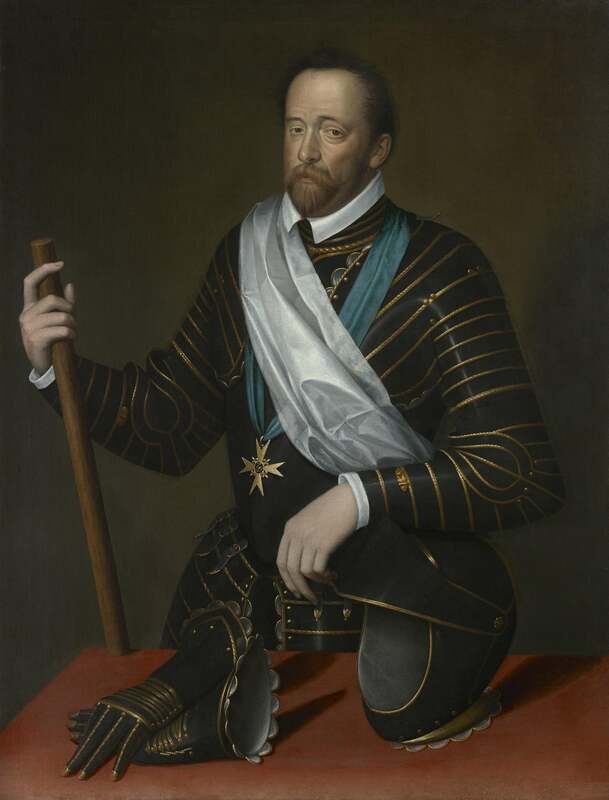 In 1564 he assisted Emperor Maximilian II during the Ottoman invasion in Hungary, and the following year again at the siege of Malta. From there he moved to Rome, distinguishing himself in the defence of Ancona. Strozzi returned to France in 1567, where he fought against the Huguenots. Two years later he was appointed the sole Colonel General (commander-in-chief of the army) of France, and subsequently took part to the long siege of La Rochelle. It is logical to assume that the present portrait must have been commissioned and painted around the time of Strozzi’s promotion to Commander-in-Chief of the French army in 1569, as a celebration of the great responsibility and honour therein. Indeed, here we see him wearing the Order of Saint Michel, which he would have been awarded by King Charles IX of France. The Ordre de Saint-Michel was a specific order of chivalry founded by Louis XI of France, in competitive response to the Bergundian Order of the Golden Fleece. As a chivalric order, its goal was to confirm the loyalty of its knights to the king. It was a great honour, and the highest Order in France after the Ordre du Saint-Esprit. By 1581 Strozzi was created Lord of Bressuire, and pivotally was employed as a mercenary by the claimant to the Portuguese throne against Spanish Habsburg King, Philip II – António, Prior of Crato. With a contingent of French, Dutch, English and Portuguese volunteers, he set sail to the Azores, a Portuguese Atlantic territory that still did not recognize Philip II as king. His fleet was, however, destroyed in the Battle of Terceira in July 1582. He was taken prisoner, and duly executed and thrown into the sea from a Spanish ship. Pierre Dumonstier was primarily a portraitist, best known today for his delicate pencil drawings, though as the present fine oil attests, he must have also been accustomed to painting full-scale commissions. He came from a prolific dynasty of artists. His father, Geoffroy Dumonstier (d. 1573), was master illuminator to Francis I of France and Henry II of France. His elder brother Étienne (c. 1540 – 1603) was official painter to Catherine de Medici and Maximilian II, while his younger brother Cosme (d. 1552) was painter to Marguerite de Navarre. Étienne's son Pierre and Cosme's illegitimate son Daniel also became artists, though Pierre himself had no issue. Zvereva has noted that Pierre probably received the same training as his elder brother, Etienne, and the pair often worked together in the service of the queen mother, Catherine de Medici. Portrait sketches of Étienne by Pierre are still in existence today from when he accompanied Étienne to Vienna in 1569, (Hermitage, St. Petersburg), suggesting a close bond between the brothers. Pierre had entered the service of Catherine de Medicis shortly after his brother, probably around 1565 – 1567, but the few accounts preserved for this period are partial, and his name appears only in that of 1583: ‘To Pierre Dumonstier… a painter, the sum of one hundred crowns’. By 1588, however, it was the king’s treasury who paid his wages, though Zvereva notes that unlike his brothers, Pierre was not officially engaged by Henri IV, and in his will of 1601, he is described only as ‘painter and valet of the late Queen mother’ (Zvereva, op. cit.). He was then living in Paris in Rue du Temple. Louis Dimier gathered 65 drawings in Pierre I's hand, mainly portraits of Étienne and Armand de Gontaut-Biron, inscribed "By Pierre Dumonstier for Daniel Dumonstier" (Musée Bonnat, Bayonne). A. Zvereva, Portraits dessines de la cour des Valois, 2011, pp. 401-402.